My main research interests are in Knowledge Engineering, and more particularly in conceptual representation and inference processes applied to problem solving. The first axis was initially focused on the formalisation of IDM (Inventive Design Methodology) that is applied by companies to improve their R&D activities. A knowledge manager was developed to assist the IDM experts during their activities. Indeed, during a new study, experts are brought to work with various models at different levels of abstraction. The knowledge manager suggests the experts the use of the relevant knowledge sources (barely formalised in natural language), consistent with the level of abstraction of the model they are building. The manager is also able to complete the rest of the models, by exploiting the semantinc links obtained among the different knowledge sources. We are currently working in the capitalisation of experience of past studies to improve the whole inventive process, by the application of succesfull results to new cases that can belong to a complete different domain. Case-Based Reasoning and SOEDS and DDNA technologies will be used with this aim. These works are led in the framework of a co-supervised PhD thesis with the LGECO laboratory. The second axis is focused on the Formalization of the touch control process of a product. The proposed research work aims to study the tactile perception. Indeed, in the context of quality control, it is this type of perception that is more requested, the controller generally operates exploratory movements with his hand to control the product. Therefore in this research project, we will focus on the development of an hardware and software IDA (intelligent data analysis) platform capable of supporting various mechanisms for analysis of unstructured data from sensor networks. This scan task involves an artificial perception process designed to abstract the characteristics observed by sensors on domain concepts that describe the object of study. A key aspect of this project is to define a strategy for anchoring symbols to build interpretations at different levels of abstraction. These works are led in the framework of a co-supervised PhD industrial (CIFRE) thesis with the SYMME laboratory and INEVA. The third axis concerns the HALFBACK project, whose funding was confirmed on January 31st 2017. 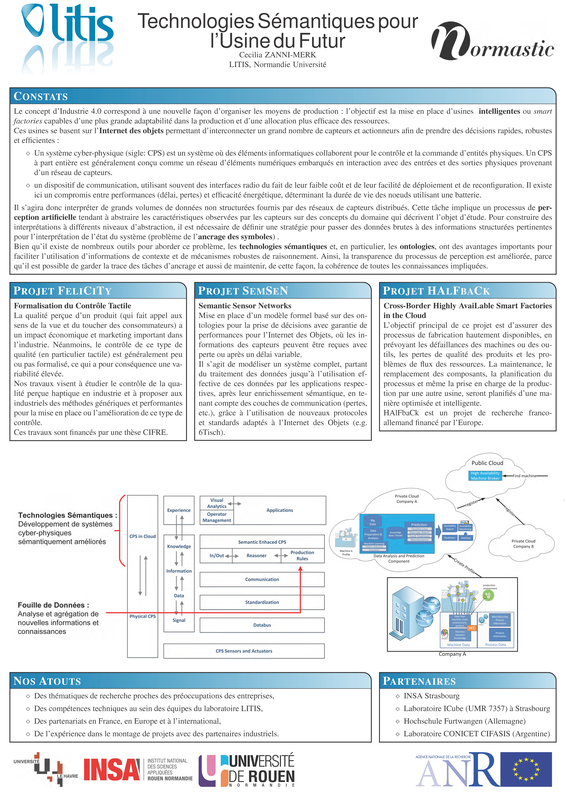 This project is about the creation of highly available intelligent factories in the cloud and concerns the application of semantic technologies for the proposal of intelligent maintenance plans. A new axis has been launched in October 2017, with the STEaMINg (Semantic Time Evolving Models for Industry 4.0) project, funded by the Normandy region. In an Industry 4.0 framework, beyond the need to interpret data generated by sensors that monitor processes, the necessity for real-time adaptation to unforeseen events or for predictive monitoring imply the need to manage knowledge models that evolve over time. In this project, we will therefore focus on understanding the knowledge evolution over time and its distributed management, in an industrial framework, with different case studies. The increasing availability of High Spatial Resolution satellite images is an opportunity to characterize and identify urban objects. Image analyses methods using object-based approaches based on the use of domain knowledge, are necessary to classify data. A major issue in these approaches is domain knowledge formalization and exploitation. The use of formal ontologies seems a judicious choice to deal with these issues. Therefore, the aim of these works is to highlight the benefits in the use of a thematic ontology for automatic regions labelling. Description logics (DL) are being used to exploit the knowledge in the ontologies and develop software tools to assist the automatic labelling of satellite images. In the framework of these works, I have participated in the COCLICO project funded by the French National Research Agency. In the framework of the IDEX (excellence initiative) called « Complex Identities » I have worked with the Faculty of Arts of Strasbourg University to try and provide the means to understand the complexity of this institution, with the use of semantic technologies. This collaboration is described in number 27 of the #Savoir(s) journal of May 2016.